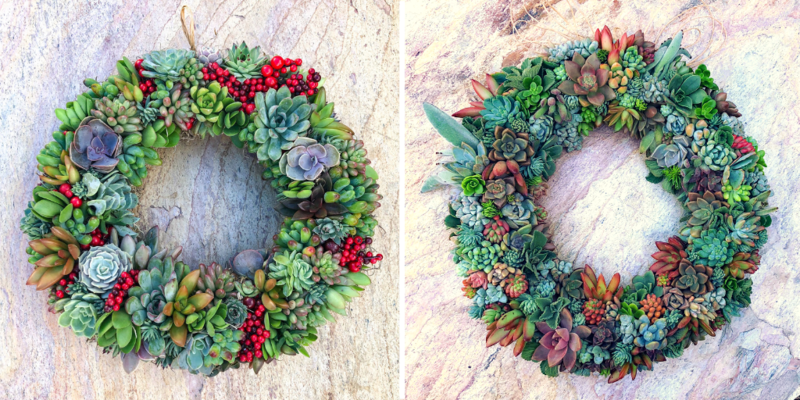 If you love succulents as much as we do, then you probably bought or made yourself a succulent wreath over the Christmas holidays. Of course, you can make a living wreath beautiful and festive year-round, so we want to give you all the tips and tricks we know to keep your succulent wreath looking its best for as long as possible. By the time you’ve had your wreath for three to six weeks, any number of things could have happened. Whether you used hot glue or floral pins (also called greening pins) to attach your succulents to the wreath form, it’s possible that they could have loosened or fallen off after hanging on the front door for a few weeks. Maybe you forgot to water, leaving your succulents wrinkly and thirsty (looking like they could bend really easily, possibly some dry lower leaves). Maybe your plants have picked up some pests if they’ve been outside. If the wreath’s been inside, your plants could have stretched (looking more like stems and leaves than flowers). Maybe a few stray plants have fallen off of your wreath, especially if it’s on a door that opens and shuts frequently. So many possibilities, but now that you’re responsible for all of these living plants, you might as well keep their home looking nice until you’re ready to dismantle the whole thing and grow a succulent garden of your own (your wreath should last 3-6 months, or longer, with good care before replanting is called for). Succulent cuttings require a lot of energy to create new root systems, which root into the moss you’ve affixed to your grapevine wreath frame or wire form. (We recommend Spanish moss of sphagnum moss for environmental reasons). So there might be some shrinkage between the plants, leaving holes that can be filled with new cuttings from your succulent garden. 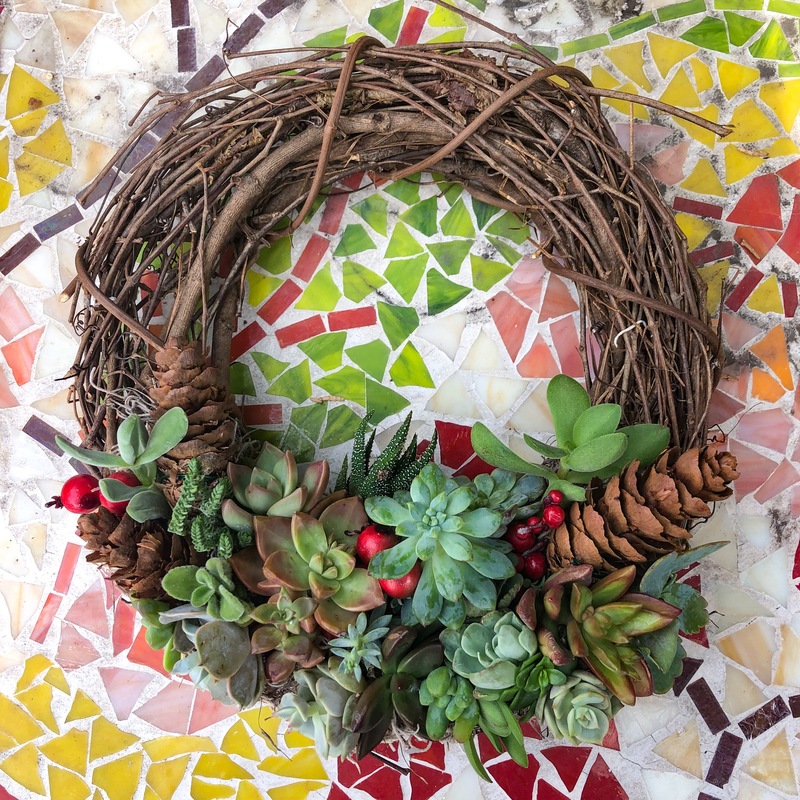 Where you keep your wreath will determine how well your succulents keep their original shape and color – whether they stretch into stems due to insufficient light or fade out because of too much direct sunlight. Water and maintenance is also super important, as well as replacing any dead or fallen plants as time goes by. If you made your own wreath this year, that’s AWESOME. DIY projects are so fun, and this one in particular is a pretty low barrier to entry. All you need is a wreath frame of your choosing (grapevine, wire frame, or splurge on a pre-made moss wreath form at your local craft store), Spanish moss, hot glue, the succulent section at Home Depot, a sharp knife, and some floral wire. Even better, if you have your own succulent garden with a variety of succulents, you can use cuttings and save a few bucks on plants. But we digress. 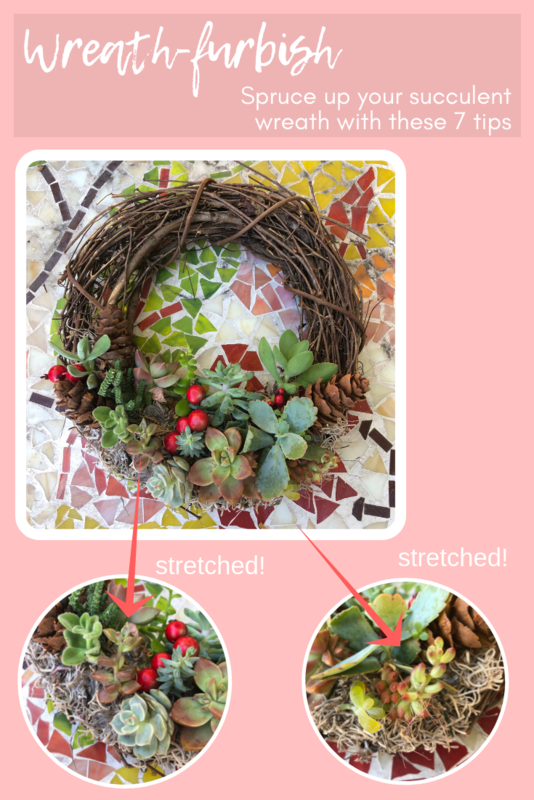 If you’ve made your own succulent wreath, it’s likely that you’ll feel a little bit more confident going in and doing surgery on your own handiwork. But don’t be intimidated if you bought one and it needs a little TLC. You are perfectly capable of taking care of this thing yourself! We’ve thought through all of the various potential scenarios you could encounter when launching a “wreath-furbish” and have provided a solution for every problem. If your wreath is on a door that opens and shuts constantly, some plants might have fallen off. You can glue them (or new cuttings) back on using hot glue or floral glue, filling the holes where the missing plants were. If the holes are covered in the old glue, you can cut that away first with sharp scissors before adding new glue. If your wreath was in a place with less than ideal light, the blooms might have stretched a bit. Totally remove and replant in a better-lit part of your house or yard. If your wreath was out in freezing temps, some of the plants might have bitten the dust (sometimes they just die inexplicably too). Gently remove the dead plants and replace with new, fresh cuttings using hot glue or floral glue. If you’re in a warm and buggy place, your plants might have picked up a few unwanted companions. Some of your leaves might have shriveled and dried up. This is NORMAL, but they can attract bugs, so gently remove them. If your fingers are too big not to disturb the other plants, use tweezers. If you haven’t been watering your moss regularly, that’s on your list of to-dos as well. Either run the whole wreath under a gentle faucet or heavily spray the moss with a spray bottle. Do that a few hours (or a day) AFTER you’ve glued or pinned your new plants. Here’s an example of a wreath that wasn’t quite getting enough light. We’ve pointed out some of the things we’re talking about (although it was inside, so luckily no pests). It was kept in a retail store for about a month, and the light wasn’t quite perfect. It was also transported and moved around a few times, so some of the plants fell off. You can see that we moved things around a little to fit the new pieces and show the best side of every plant. Making these wreaths is like a combination of a puzzle and Tetris, twisting and turning the plants until they fit just right. A super fun and stimulating craft project! Besides being beautiful and magical plants, succulents have a reputation of being low-maintenance and easy to care for. While they are relatively easy to care for compared to so many other botanicals, taking care of a living wreath requires a lot more attention than the artificial pine wreath you might have left in the attic this year. These plants are alive, and live plants require care. Sure, you can forget about them for a week or two without any real consequences, but after that, they want water and attention. And if you’re getting freezing temperatures, it’s best to bring it inside at night. Care instructions and replanting instructions are enclosed in every order you place from Succulents for Hire, guaranteeing that you’ll have everything you need to keep your succulent wreath looking its best for as long as possible. 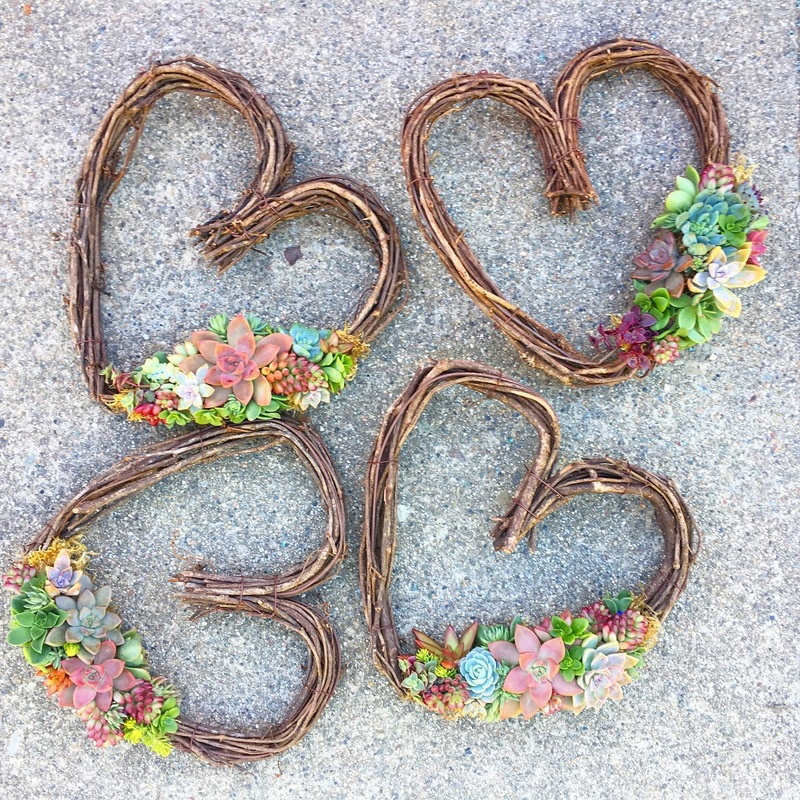 And Valentine’s day is just around the corner, so if you’re in the SF Bay Area, be on the lookout for some Heart Wreath Workshops nearby – or host your own! If you want to learn how to make a grapevine succulent wreath (heart-shaped or otherwise) and would like to host a party at your home, workplace, or a local business willing to host, send us a note using our contact form. We’ll set up a time to chat! ← Why Not Use Succulents in Your Wedding Floral Crown?